What The Heck Is The Trek ‘Thru Shaft’? As of today, Trek Bikes is announcing a new suspension technology that’ll be debuted on its 2018 mountain bike suspension line. Models such as the Fuel EX, Remedy and Slash will feature ‘Thru Shaft’ technology, which is essentially a customised shock design. 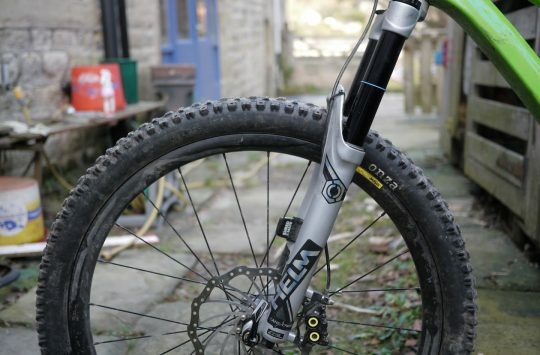 The rear shocks will still be made by Fox and RockShox, but they’ll be very different to any other shock you’ve seen. This is a new Thru Shaft shock that you’ll see on select 2018 Fuel EX, Remedy and Slash models. You may recall that Trek partnered with F1 suspension specialist, Penske Racing, when it released the original RE:aktiv damper back in 2014 on the Fuel EX line. The RE:aktiv system uses a patented regressive damper to allow for a nice firm feel on the pedals when using the medium or firm modes on the rear shock compression lever, but with a very fast breakaway into smooth travel when a bump is encountered. That was no more apparent in our recent review of the 2017 Fuel EX 9, where the RE:aktiv damper allows you to spend more trail time in the medium and firm compression settings for improved pedal efficiency. Now back to Thru Shaft. 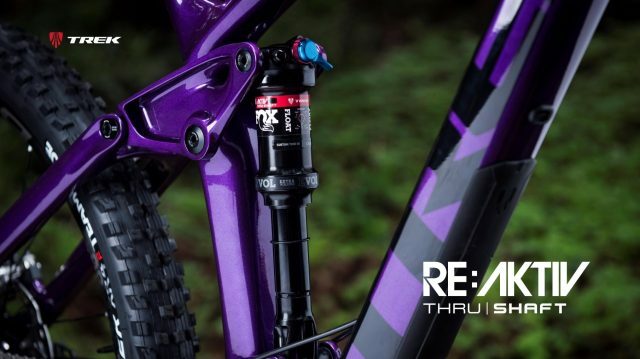 This isn’t a replacement for RE:aktiv, but rather an addition to the RE:aktiv damper, and in Trek’s eyes, an improvement to the overall system. 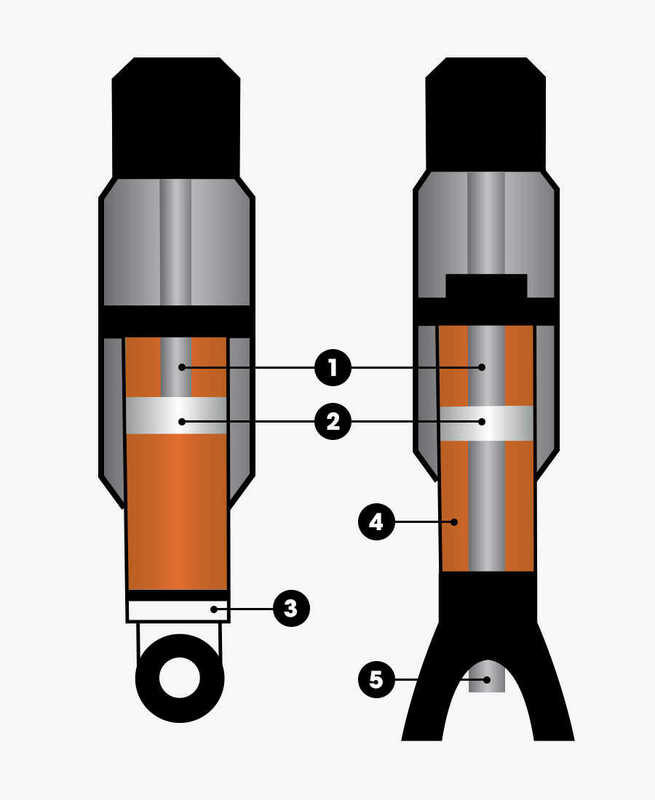 Left: Regular rear shock with an IFP. Right: Trek’s Thru Shaft shock with no IFP. 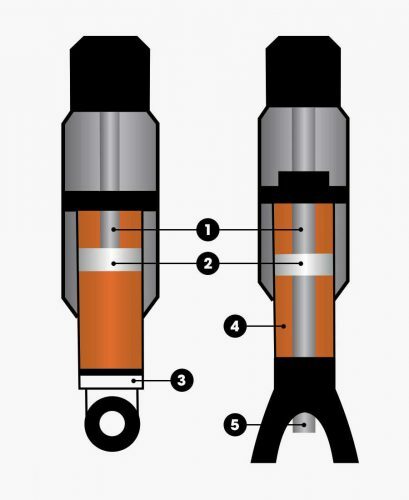 On the left is a regular rear shock, which uses an Internal Floating Piston (IFP) at the base of the rear shock (that’s #3 in the diagram). This nitrogen-charged chamber is basically there to allow for oil displacement as the shock compresses and damper oil needs somewhere to go. Because of the sealing involved (it has to be pretty darn snug to separate nitrogen from damper fluid), there’s always going to be some friction involved. 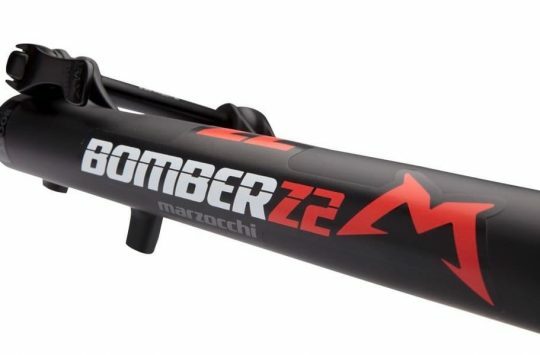 To counter that, some brands use a piggyback reservoir for the rear shock with an expandable bladder that’s kind of like a FIT cartridge in a Fox fork. However, Trek has decided to counter the stickiness of the IFP in a completely different manner – by removing the IFP completely. It’s a fully customised suspension design due to the additional room required at the base of the rear shock. 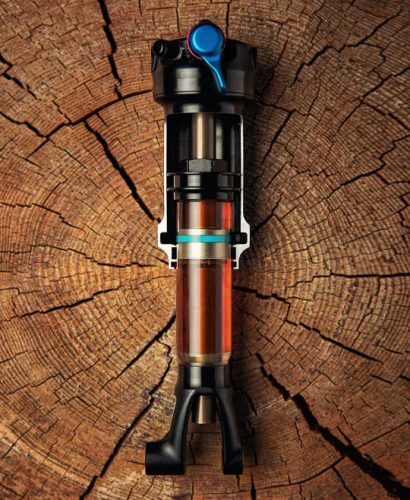 Thru Shaft essentially sees the damper rod passing all the way through the shock body, and actually exiting down the bottom during compression – hence why there’s a longer support strut for the lower eyelet of the rear shock. By doing this, Trek & Penske have designed a shock that uses a constant volume of damper oil that doesn’t need displacing. In theory, it leads to less stickiness, and particularly at the point where a shock transitions from compression to rebound. It’s a technology already used for suspension in F1, Lemans, Indy and Moto GP racing, so it’s probably good enough for mountain biking. Anywho, if you’re still not feeling what’s going on, here’s a video of Cam McCaul giving it a crack to explain how Thru Shaft works. At the very least, there’s dusty trails being shredded, so that’s cool. I’m sure it works in their favour, but it’s good to see a bike company sharing the love with competitor shock manufacturers. 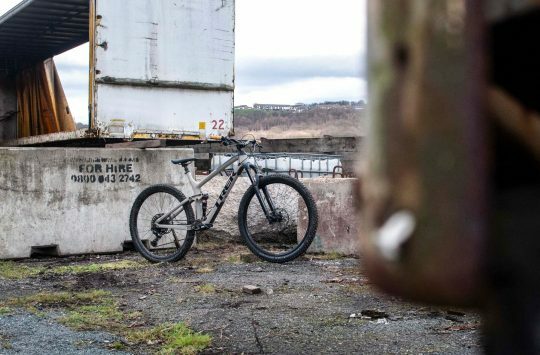 It feels a bit like Trek have seen everyone else adapting trunnion mount shocks and boost hubs and are upset that their bikes aren’t nonstandard and incompatible enough. Bringing back the through shock that AMP used on the B3 frames and linkage forks, hope the shaft seals are better. All Australians say hence why? hence means that’s the reason why, so that’s the reason why , why it doesn’t need why after it. I am totes using Onywho from now on also. So the whole shock is easier to service then? I think the name “Trek Slash Thru Shaft” might put off some male buyers? Also, doesn’t oil expand when it gets warm? Won’t it still need an IFP or bladder of some kind?